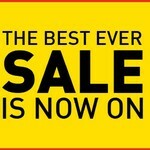 THE BEST 3 DAY SALE EVER!!! We are overflowing with consignments and we've got DEEP DISCOUNTS on our MAIN FLOOR CONSIGNMENTS AND THIRD FLOOR STEALS on HOME GOODS. Hundreds of boutique closeouts arrived ALL NEW WITH TAGS AND ON CLEARANCE. Third Floor BLOW OUT on furniture and Home décor. Bed Frames, and sofas, dining tables, electronics, recliners, art, frames, and hundreds of new consignments. Visit the newly remodeled basement and check out new vendors for handmade goods, re-purposed furniture, and funky stuff you just won’t find anywhere else at Whistling Dixie’s Co-Op inside In Your Wildest Dreams. FREE Sno Cones, cold beverages, snacks ALL THREE DAYS. Sign up for Send-ME-DEALZ at the kiosk at the register for an additional 10 % OFF your entire purchase.